The US Senate Appropriations Committee has approved its FY-2019 Transportation, Housing, and Urban Development spending measure (S. 3023). 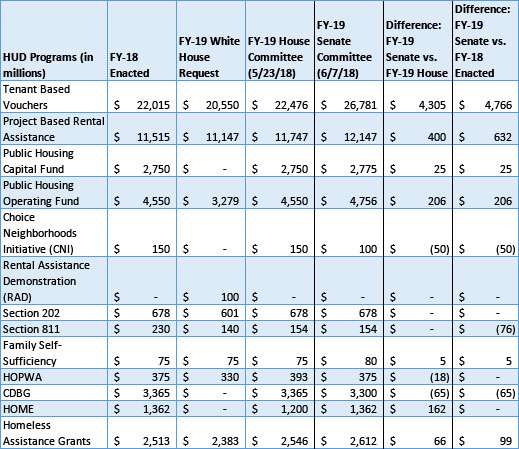 The Senate committee proposes an additional $4.3 billion in Tenant Based Vouchers and an additional $400 million in Project Based Rental Assistance over the House’s T-HUD funding language (which was approved by the full House Appropriations Committee on May 23). 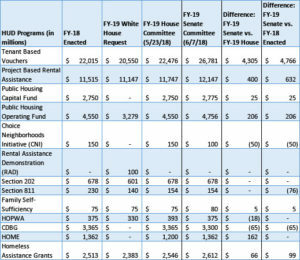 While the House would provide level funding for The Choice Neighborhoods Initiative and CDBG, the Senate proposal cuts funding by $50 million and $65 million, respectively. Both measures would increase overall HUD funding, rejecting the White House request to cut funding by almost $11 billion. Neither of the bills are currently scheduled for a floor vote.